David Dun and Simon Paterson's gravestones are located at the entrance gate to the old cemetery on Barrhill Road, Cumnock. This was originally the site of the burgh gallows, and they were buried here as a mark of disrespect. The original sandstone memorial is shown to the right - tradition claims that Old Mortality recut the lettering. The stone was replaced with a granite stone, of the same size and inscription, carved by Kevin Roberts, and paid for by the SCMA. The Covenanters were attending a Conventicle held by Rev. James Renwick that was taking place somewhere in the parish of Carsphairn, in the summer of 1685. Some say the site of the Conventicle was at Glenmuck farm, which is actually in Dalmellington parish, Ayrshire. A large crowd had gathered to hear him preach, for he was a renowned speaker, one whose wisdom and knowledge of the scriptures was well-founded, even although he was then only 23 years of age. After the Conventicle had finished the congregation dispersed, each finding their own way home, lest a large crowd should attract the attention of the soldiers who were in the district, searching for such meetings. Four Covenanters travelled to the north of Dalmellington, where on the slopes of Ben Beoch they decided to rest in a large stone enclosure known as the Tod Fauld, a place where sheep were gathered at night to protect them from foxes. However, the local farmer, who was an adherent of the Covenant himself, became aware that there was a party of soldiers in the district, looking for non-conformists. He made his way to the Tod Fauld where he warned the four men of their approach, and suggested that they travel further. Although it was nightfall, the men decided to continue, and crossed the Martyrs' Moss to the upper slopes of Carsgailoch Hill, five miles distant, where they decided to stop and rest. This hill is a low eminence to the south-west of Cumnock in Ayrshire, just over the border in New Cumnock parish. Although it rises to almost 1,200 feet above sea level, so slowly is the ascent that the hill is little more than a high stretch of moorland, now much afforested. Old accounts spell the name 'Crossgellioch', or 'Corsegelloch', but I have used the spelling that appears on modern maps. The Covenanters' journey had been a hard one, and though it was by now day, soon they were fast asleep in the comfort of the heather. The party of highland soldiers was under the command of Colonel James Douglas, and they came upon the men lying in the hollow. They were rudely awakened, and one of the men jumped up with such a start that he managed to run away from the soldiers. This made the highland-men even more suspicious of the small group and they were asked to swear the Oath of Allegiance to the king, but all refused to do so. With some pressure the soldiers managed to discover that the men were returning from a Conventicle. This was sufficient grounds for Colonel Douglas to order his men to shoot. After the volleys echoed over the moss three corpses were left on the ground. They were Joseph Wilson, John Jamieson and John Humphrey. Of their backgrounds nothing is known. The soldiers who were on horseback pursued the man who had run away, Alexander Jamieson, a brother of John, and he was soon caught up. Why they did not kill him on the spot is not known, for he was arrested and taken into Cumnock where he was locked up in the tolbooth, which at that time stood on the north side of the Square. What became of him thereafter is not known. Two more of the Covenanters caught on the hilltop were also taken. 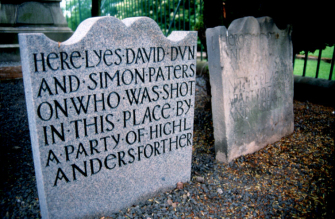 They were David Dun and Simon Paterson. It is said that David Dun almost managed to make an escape but that his horse sank into a wet area of bog. The two men were dragged to Cumnock where they were held prisoner for a short time before being shot.Tradition states that word had reached David's sister, Margaret, of his arrest. As she made her way to Cumnock to find out his fate, she too was shot. David Dun was probably a native of Ochiltree parish, for a David Dun of Closs farm was named in a list of rebels in 1684. Of Paterson nothing is known of his origins, but he may be related to the Patersons of Dalmellington. Both seem to have left their homelands and taken themselves to the uplands on the borders of Dumfriesshire with Selkirkshire, where they hid from the soldiers who were in pursuit of them. What the Covenant could dow! Dang the Deevil owre Dob's Linn.